Kjerstin Göransson-Ljungman was an architect and a writer of detective novels. She is best known for her first novel, 27 sekundmeter, snö, which is considered to be the first Swedish whodunit novel. Kjerstin Göransson-Ljungman was born in 1901. She was the daughter of Karl Ernst Ljungman and his wife Ellen Elisabeth Ljungman. She attended the Althin painting school whilst also studying at Uppsala University. She began her architectural studies in 1924 at Kungliga Tekniska högskolan (KTH, Royal Institute of Technology) in Stockholm and, after graduating she ran her own architect’s office there. Along with her colleague Ingeborg Wærn Bugge – who was the first woman to qualify as an architect in Sweden – she authored a report entitled Bostad och hushållsorganisation: studie över ett aktuellt rationaliseringsproblem: staden, landet, 1936. She was married to fellow architect Edvard Stenlåås between 1928 and 1933. She remarried in 1944, this time to the actor Curt Norin, and their marriage lasted until 1951. Kjerstin Göransson-Ljungman sometimes allowed her property in Sigtuna to be used for cultural gatherings and discussion evenings. For example, in 1954 a discussion evening was held there on the subject of children’s and youth books. Authors such as Lennart Hellsing, Inger Brattström, and Sven Wernström were present. In 1927 Kjerstin Göransson-Ljungman set up Kvinnliga Teknologers Sammanslutning (KTS, society of female technologists) at KTH. The society was active until it eventually dissolved in the 1950s. Kjerstin Göransson-Ljungman spent several years during the 1940s serving as the secretary of Föreningen Svenska konstnärinnor (association of Swedish female artists). She mainly painted still lifes and landscapes, often marinas from Öregrund, and would sometimes exhibit her work at galleries. Kjerstin Göransson-Ljungman released her first novel, 27 sekundmeter, snö in 1939. This book is often considered to be the first Swedish whodunit novel, a genre of detective novels which first became very popular in Sweden during the second half of the 1940s, and even more so during the 1950s. A whodunit is largely centred on the actual murder mystery by positing the crime as an unsolved problem or puzzle. There should be a limited number of suspected characters and the murder should preferably occur within a naturally enclosed environment which enables the detective to examine all the clues in peace and quiet without the worry that external factors will throw everything into question. In 27 sekundmeter, snö the suspects are gathered at a snowed up hotel in the Swedish mountains. The novel caught the attention of literary critics and won general acclaim. Mord på auction, featuring the eccentric amateur detective Selma Nilsson-Löwe as the lead character, won Expressen’s Sherlock statuette for best detective novel in 1959. Kjerstin Göransson-Ljungman continued to write detective novels throughout the 1940s and 1950s. Her last book, Oss bröder emellan, was published in 1960. As recently as January 2006, Sverige Television broadcast a newly filmed miniseries based on 27 sekundmeter, snö. Although Kjerstin Göransson-Ljungman was best known for her detective novels she also wrote other types of books. She wrote several novels for young people, such as En värld av drömmar vävd, 1953, which was based on autobiographical material. The youth detective novel Fjällhedens hemlighet won second place in the 1946 Wahlström & Widstrand competition for best youth detective novel, in which first place was shared between Åke Holmberg’s Skuggornas Hus and Astrid Lindgren’s Mästerdetektiven Blomkvist. 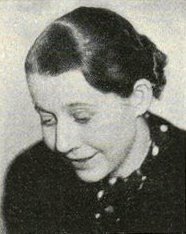 Several of Kjerstin Göransson-Ljungman’s books were adapted for the radio and she also wrote several manuscripts directly for the radio, including the prize-winning Cirkusflickan, 1949. In addition to these works she also wrote a number of novels. Her 1941 novel Så blankt havet ligger, which portrayed a marriage, won the Stora svenska romanpriset that same year. In addition she wrote a biography of G. F. Göransson, the founder of Sandviken, entitled Konsuln, 1959, as well as a cookbook. The latter, entitled Medan potatisen kokar, 1940, was a collection of easy-to-prepare everyday recipes. Kjerstin Göransson-Ljungman had been taught to cook by the well-known food writer Jenny Åkerström. Just in time for Christmas 1955 she also edited an anthology in which famous Swedes recounted memorable Christmases, Jular jag minns. Kjerstin Göransson-Ljungman died after a period of illness in April 1971. The auction organised to deal with her estate at her Sigtuna property received considerable press attention, in part because she had collected an extensive art collection during her lifetime. Kjerstin Gertrud Elisabet Göransson-Ljungman, www.skbl.se/sv/artikel/KjerstinGoranssonLjungman, Svenskt kvinnobiografiskt lexikon (article by Sara Kärrholm), retrieved 2019-04-20.